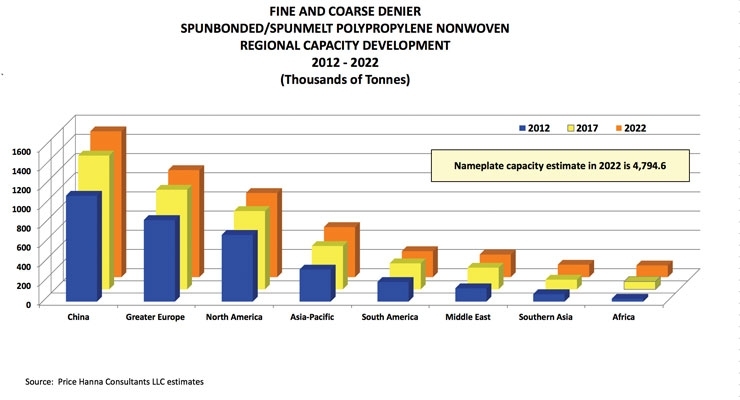 We estimate that the global nameplate capacity of spunbonded/spunmelt polypropylene nonwovens at year end 2017 was just below 4.4 million tons. Based upon announced expansions, nameplate capacity will increase to about 4.8 million tons by 2020 equal to annual growth rate of 1.8%. Actual global capacity is likely to be somewhat higher in 2022 than our current estimate given that suspected, but not yet announced, capacity expansions are omitted from our estimates and still more capacity expansions may be announced. At present, about 84% or 0.346 million tons of new capacity projected for installation from 2017 to 2022 will be commissioned by 2019. The amount of total capacity expected to be installed during 2017-2022 is currently about half of that installed during 2012-2017. During this period, 0.949 million tons of new global capacity was commissioned equal to an annual growth rate of 5%. The amount of new capacity installed since 2012 has resulted in oversupply in a number of regional markets. We expect new capacity installations in the Americas, the Middle East and Greater Europe during 2017-2022 to slow and grow at higher rates in Asia Pacific, Southern Asia, China and Africa. We expect capacity growth in Southern Asia (India/other); Africa and Asia-Pacific will be above the global average and range from 3-8% annually from 2017-2022. This new capacity will be installed to meet growing demand. We estimate that capacity growth in Greater Europe and North America will average about 1.5% annually during the period as these regions are oversupplied and capacity absorption is needed. In South America, the market is oversupplied. Some late generation capacity has been idled and older capacity shut down due to weaker than expected demand. Demand is expected to improve late in the period. In the Middle East, the market is significantly oversupplied after a period of significant expansion. This oversupply has been worsened by significant new capacity additions in North Africa and less than expected demand growth. Capacity growth in China is expected to be moderate, as compared to prior periods, as market penetration has increased significantly over time as has the capacity base. Global demand growth for nonwovens made on this technology is expected to grow 4.7% per year in tons and 4.8% in square meters during 2017-2022. Given this demand projection, global overcapacity will be partially absorbed but capacity utilization will be uneven among global regions. Higher square meter demand growth is related to the use of lower weight nonwovens in hygiene end uses which results in lower demand in tons. We believe that most, if not all, of the downward trend in nonwoven basis weights has been fully realized and that product weights have stabilized or may tend to increase. Demand is expected to grow at higher rates in emerging markets where market penetration for disposable and durable nonwovens has yet to be fully achieved. Total market growth in tons is expected to be highest in Africa, Southern Asia and China and in the Asia-Pacific region during 2017-2022. Somewhat attractive growth is projected in Greater Europe while moderate demand growth is expected in North America, South and Central America and the Middle East. The largest market for spunmelt polypropylene nonwovens is disposable hygiene end uses (baby and adult diapers, fem care), which commands about two thirds of the total worldwide capacity of fine and coarse denier spunmelt polypropylene nonwovens. Other important markets for nonwovens made from spunmelt polypropylene technology include a variety of construction applications (geotextiles, residential and commercial wall wrap and ground covers), home furnishings (furniture construction fabrics and carpet backing), medical and industrial protective apparel, automotive and other end uses. We estimate that more nonwovens are made from spunmelt polypropylene technology than any other type of nonwovens technology worldwide. Demand for spunbonded and spunmelt nonwovens in hygiene end uses will drive growth. The key drivers of demand for disposable hygiene nonwovens are birth and aging rates, market penetration and per capita income. These factors play a key role in the projected demand growth for disposable nonwovens in India, Africa and China. The market penetration of disposable nonwoven products for hygiene is still quite low in India and Africa but is improving quickly. Year-over-year demand growth in China has weakened from earlier high levels as market penetration is now high in urban China but still low in rural areas. On the whole, hygiene demand growth in the Asia-Pacific region remains attractive founded on still low market penetration of disposable hygiene products in selected developing countries within the region. We expect machine capacity utilization to increase from 2020-2022. In certain global regions, this will lead to installation of new capacity to meet demand. In some of those global regions which are oversupplied, demand is somewhat concentrated among selected producers. These producers will have higher capacity utilization than the regional average, which may drive installation of added capacity in an otherwise oversupplied market. Secondly, the latest generation spunmelt technology offers higher throughput, faster line speeds, finer fiber denier extrusion, greater energy efficiency, higher output, digitalization (“Smart”) process monitoring, high loft and softer spunmelt nonwovens than earlier generation technology. This technology also comes at a higher capital cost, but once fully utilized, can produce a lower cost product. The versatility and benefits of this new generation of technology will motivate some producers to employ the latest technology, even in advance of demand being sufficient to absorb the new capacity. Thirdly, producers seek to be positioned in growth markets and to position assets within global regions to protect share. There has been significant competitive positioning in strategic and emerging markets in the last few years. New producers have entered North America, China, South and Central America, Egypt/Africa, Russia, Indonesia and India. More recently, strategic positioning within global regions has led to the installation of capacity more closely located to demand to minimize transportation costs. Lastly, while there has been some consolidation among producers, there has been very little equipment rationalization. Early generation equipment continues to operate, mostly at cash cost margins. We expect that the newest units of capacity will be utilized first as this technology will have the greatest product capability and will achieve lowest cost of manufacture once the lines are fully utilized. The next earliest generation of capacity may then replace even older units of capacity now in operation, possibly resulting in the retirement of very early generation technology. We estimate that in 2017, 24% of all fine denier spunbonded capacity still in operation was early generation. In addition to how producers deal with the installation of new and the rationalization of old capacity, there are other impacts that new installations of spunbonded polypropylene capacity bring about. One of these impacts is the increasingly high capital cost of new spunmelt polypropylene technology, which could prompt consolidation among some producers to lessen the burden of the high investment cost. This issue has given rise to the introduction of smaller units of capacity which incorporate the most modern features of advanced spinning technology at lower cost. A second related impact is the challenge of technological obsolescence requiring continuing reinvestment to remain competitive. The rapid pace of technology modernization drives concern about falling behind in the race to modernize, forcing a choice between modernizing, repositioning or even withdrawing from the market. Still, another issue will be the change in import and export flows as new producers in regions formerly requiring imports seek to become exporters. We are witnesses to producers continuing to invest in new technology in order to remain product capable and to build new plants in developing markets to achieve higher growth. Consolidation among the largest producers has occurred and may likely continue. Consolidation among smaller producers may also occur for many of the same reasons we have described. The modernization of the spunmelt polypropylene technology platform is healthy and transformative. New capacity is being installed to serve growing market demand and the markets’ challenging and ever changing needs. Significant work is underway and much is soon to be realized to improve the loft and softness of spunmelt nonwovens. These advancements portray the vibrancy of this leading technology for nonwovens manufacturing in the world.